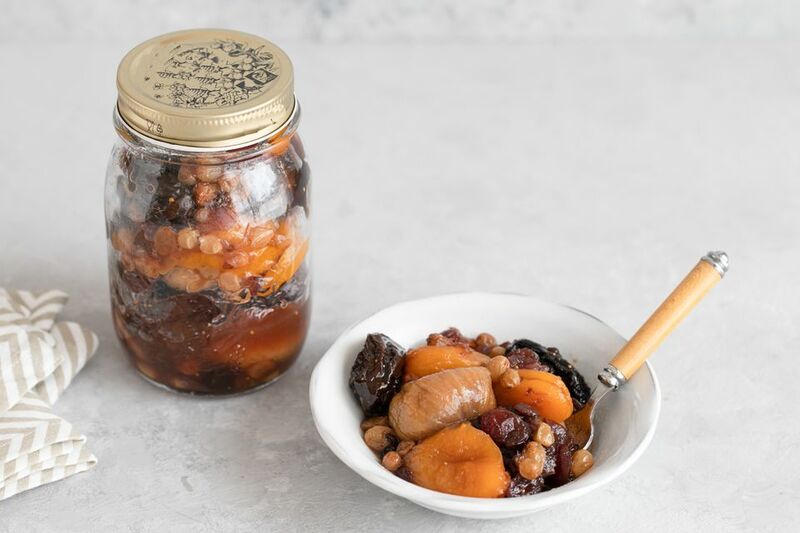 Polish dried fruit compote or kompot (KOHM-poht) is a simple-yet-satisfying dessert of stewed fruit eaten year-round in Poland, but it is especially popular in the fall and winter. It uses summer's bounty that has been preserved by drying and then reconstituted with sugar, water, spices and, in some cases, liquors. It is a traditional Christmas Eve (wigilia) dessert and originally was made with 12 different dried fruits to represent the 12 apostles (I wonder which one was Judas?). When cooked down to a thicker consistency, it becomes a type of jam that is great dolloped on toast or ice cream. It's also a great edible gift, but it must be refrigerated. Dried fruit compote keeps for about 1 week. Here is a recipe using fresh fruit as opposed to dried fruit -- Polish Rhubarb Compote Recipe. In a large saucepan, place 1 1/2 pounds various dried fruit of choice, 8 cups water, 8 whole cloves, 2 cinnamon sticks, and, if using, lemon zest and sugar. Bring to a boil, stirring frequently. Reduce heat and simmer, covered, for about 20 minutes or until fruit is tender and syrup has thickened slightly. Add more water if you like more of a liquid consistency or, for a thicker compote, continue simmering to reduce the liquid further. Create an ice water bath. Put your saucepan in the ice water bath to cool the compote. Then transfer to impeccably clean containers.